hill- or mountain-shaped my progress was. Happy last day of National Novel Writing Month. 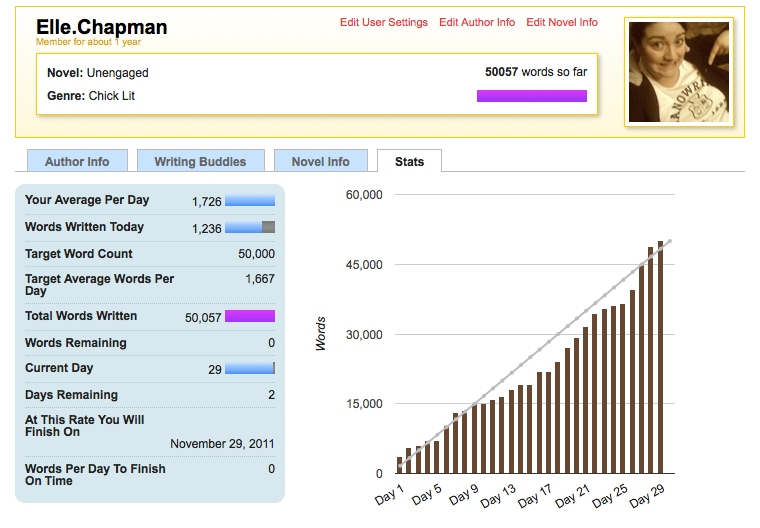 If you read my blog yesterday, you know I reached 50,000 words (and some change) during my lunch break. What a ride. 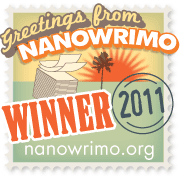 Today, I was going to write an epic post about my NaNoWriMo 2011 experience. I was going to get into the dirty details, but I'm not. 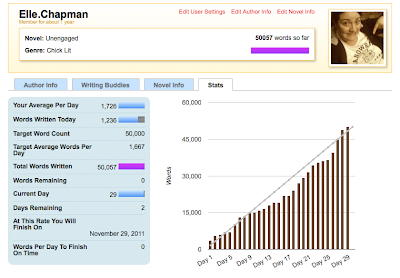 I crossed the finish line before the Nov. 30 midnight deadline, and that is good enough for me. How I did it doesn't matter, I did it and that's all I care about. The only lesson I want to share is this: persistence pays off. We all have obstacles to overcome. We all have excuses. None of those matter in the long-term if you want to achieve your goal and tell a story. I would like to say thank you to everyone who supported me throughout this process. From my uncle who asked me how my novel was going during Day After Thanksgiving dinner to my friends who offered me well wishes to my Tweeps who sent me daily words of encouragement to you readers. Last year, I mostly kept to myself throughout this process. I was often frustrated and discouraged and wanted to give up. Thanks go to my local Municipal Liaison Lisa Kovanda. She's been a great support, and I'm proud to have her leading our team. A big shout out to my writing buddies Jacie Noel and Glenna Parks. You ladies helped keep me on task and our write-ins and write-outs were always fun. I also want to thank all of the wonderful guest bloggers who participated in Novemberpalooza. Your posts did more than free me up to write — they informed and inspired me. Readers, you can help me thank them by checking out their posts and leaving them feedback if you haven't already. This year, even in my worst lowest moments (and there were low ones) I knew I would get it done. Thank you for reminding me I was not alone. Good luck to all of you still finishing up your NaNoWriMo adventures. I'd love to hear about them.